Sherry Harper Wong models DKNY designs during a wardrobing presentation at Neiman Marcus. Last night, Ala Moana Center's DKNY boutique also co-hosted In Style's fall fashion soiree to benefit Diamond Head Theatre. The bubble skirts, the leggings, the empire waist -- ever notice how the fashion world moves in step, season after season? It's gotta be collusion, right? Not according to Shelly Bromfield, who wields the lofty title of director of inspiration at DKNY, Donna Karan's chic downtown line. After 18 years with DKNY, Bromfield confesses, "I don't know how that happens. It's just something in the air." Bromfield's job is to be a sponge, shopping and soaking up that "something" in the realm of popular culture, politics and nature, all with an eye toward predicting what you and I will want to wear two to five years from now. "There's always inspiration. I can be inspired by a pebble, the color of a carpet or a beautiful flower." So forget talking to Bromfield about the present. By her calendar, it's already 2008. Bromfield blew into town to host a wardrobing seminar at Neiman Marcus, showing customers how to personalize DKNY's mix-and-match separates. Bromfield's ability to pair disparate items from many eras and a hunter-gatherer instinct honed from years of shopping for vintage and antique wares are what got her the job in the first place. "I didn't know if I wanted to do it. I didn't want to be committed coz I'm smart, so my boss has to be smarter. But Donna's so down-to-earth, so funny. The woman's a genius. I commuted to New York for eight years when she asked me, 'So now are you ready to move?'" While here, the energetic Bromfield -- who admitted to having difficulty simply sitting on her hotel lanai and relaxing -- had her eyes open for those vital sources of inspiration. In a few minutes sitting in a dressing room at Neiman, she had already picked up on the details of a lamp and framed wall illustrations, while lifting a muted pink rose from a potpourri bowl. "There's always inspiration. I can be inspired by a pebble, the color of a carpet or a beautiful flower. I work with three-dimensional objects, never photos from a magazine because that means it's already out there," she said. 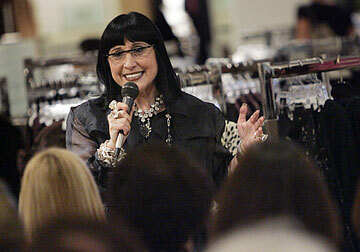 Karen Vance models DKNY designs during a Neiman Marcus presentation. After gathering a plethora of objects and textiles -- she's amassed a library of 100,000 vintage and antique jewelry pieces for DKNY for use at various times -- she'll create visual vignettes and open up her displays to the company's design team. "They'll snip a swatch of fabric or pick up things and take them back to their office and put them on their own bulletin boards to get inspired," Bromfield said. "I might light candles to create a particular mood when I bring people through. I never tell people what to do or what to think. At our meetings we'll talk about what direction we're pointing. Is it about prints? Who's our icon? How do we feel? Is there a key piece and is it going to be a dress, is it a jacket? How will people want to look going to work? How is this going to be used? "A few years ago I was watching the new version (2002) of 'The Count of Monte Cristo' so I put breeches, white shirts, vests, jacquards and riding boots on mannequins. Designers might be working on summer, but they might look at my setups and start thinking about it." The inspirations have worked their way into the soft white shirts, ruffled and bow collars, opulent vests and an overall feeling of romance that characterizes the current fall season. Shelly Bromfield, right, describes Leah Baker's outfit. "I don't know how to describe it except to say it's spiritual. It's in the air. There's always going to be someone like a John Galliano or Marc Jacobs, who will go to extremes, but visually, everyone gets on the same wavelength." DKNY is in a particularly sweet spot, as a vintage-inspired line that is also modern, sophisticated but also downtown edgy, solving an age-old fashion dilemma. "You can be old, but no one wants to look too old," Bromfield said. "You still want to look with it. That's why I say Donna's a genius. I wear DKNY, she wears DKNY, and her daughter Gaby wears DKNY. It's for people who want to look like they're wearing designer without paying the price and without looking uptight." As for what's coming from 2007 to 2008, Bromfield offers a few ideas to start thinking about when paring or adding to your wardrobe. She uses the word "eth-tic" for a combination of ethnic and athletic influences in garment trim and use of color. And it's time to think about cleaning up your act. "You won't see sloppy," she said. "Fashion is definitely heading luxe. Maybe there'll be a 1990s resurgence with cleaner, more body-conscious lines. There will be a demand for color and graphic prints that are cleaned up from today's graffiti prints."